Before I embarked on this ongoing genealogy voyage in 2006, I’d never seen so much as a photograph of my Aunt Evelyn (Deutsch) Mulqueen. All I knew of her is that she died very young, leaving my Uncle Earl Mulqueen to try to raise six children. It was this tragedy that led to a blessing in my life, when Earl and Evelyn’s daughter Laura came to live with the Hanneman family in Sun Prairie, Wisconsin. As I made my way through thousands of images in the photo collections from my father, my Grandpa Carl Hanneman and my maternal grandparents Earl and Margaret Mulqueen, I was happy to discover more about this forever young mother, gone too soon. Evelyn Mulqueen holding son Mark, circa summer 1962. Most recently, my project to digitize the 8mm film collection of Earl J. Mulqueen Sr. has brought forth the first moving pictures of Evelyn Mulqueen. The newest batch can be viewed below. These are very short glimpses of a beautiful young woman tending to her family in South Milwaukee. Carrying her infant son, Mark, or engaging with Laura, Tom, John, Brian and Earl Jr. (Bud). These are moments frozen in time. More than 50 years later, we get to witness the gathering in front of the Mulqueen home, the Christmas present opening, and the family barbecue. Normal family events, but now given such weight with the knowledge of how many of those pictured have died. Evelyn A. Deutsch was born in Cudahy, Wisconsin, on April 24, 1929, the only daughter of Michael Deutsch (1882-1963) and the former Theresa Ulrich (1891-1967). Her parents, who emigrated from Austria, married in April 1917. Evelyn married Earl James Mulqueen Jr. on December 14, 1949 in Cook County, Illinois. Her husband was a U.S. Marine war hero who lost a leg in May 1944 while preparing for the U.S. invasion of Saipan. The couple had a large family, with Bud (1950), Thomas (1953), John (1956), Brian (1959), Laura (1960) and Mark (1962) rounding out the bunch. An aggressive brain cancer took Evelyn from her family on February 2, 1963. She was just 33. Evelyn Mulqueen (center) at a family wedding in the late 1950s. 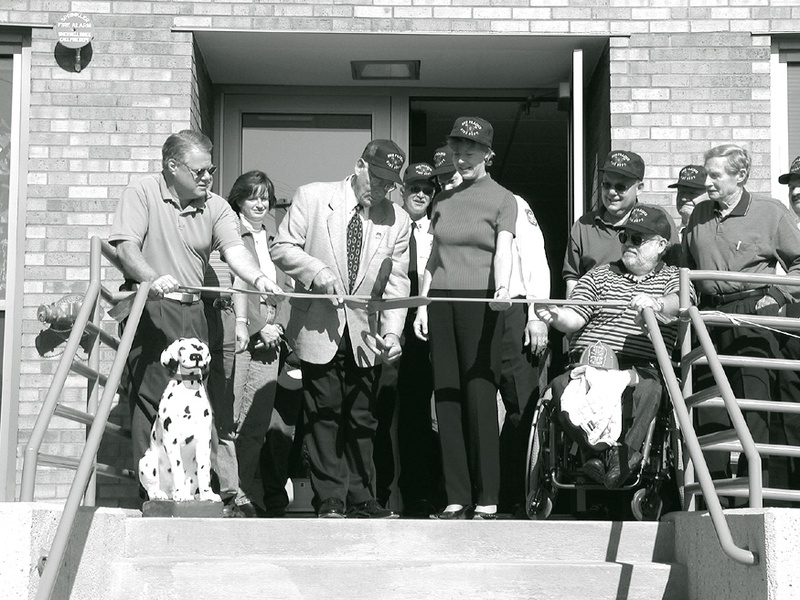 Earl J. Mulqueen Jr. is see at left in profile view. The family experienced more than its share of suffering with and after the death of Evelyn. Earl died in August 1980 at age 57. The family also saw the premature deaths of Tom (age 51), Brian (age 40) and Mark (age 46). Those tragedies are in part what makes these video images so compelling and precious. Viewers get to share a time when these heartaches were far away, and only smiles graced the frames of the 8mm film. When the wooden covered bridge was built over Cedar Creek in 1876, memories of the Civil War were still fresh and the main modes of transportation were horses and oxen pulling buggies or wagons. The clip-clop of hooves and the rolling thunder of wooden wheels have long since faded, but Wisconsin’s last covered bridge still stands proud at age 140. Nina Wilson (center) and daughter Laurni Lee (at left) on the famous covered bridge on June 30, 1941. The woman at right is unidentified. Located on a scenic route some 20 miles north of Milwaukee, the beautiful span no longer carries vehicle traffic but is still a boon to pedestrian traffic and those armed with cameras. It has served as the backdrop for countless photos over the years. It is such an important landmark to nearby Cedarburg, Covered Bridge Park was built around it and a historic marker from the Wisconsin Historical Society was placed nearby. The bridge uses wooden lattice trusses and interlaced 3-by-10-inch planks. This sketch of the Cedarburg covered bridge, by artist Frank S. Moulton, appeared in the Wisconsin State Journal on November 26, 1950. 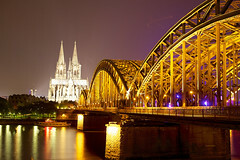 At that time, the bridge still carried live traffic, although only vehicles weighing 3 tons or less. It was built with just enough height to accommodate a wagonload of hay. The structure was welcome shelter in summer and winter for horses and drivers alike. The bridge is 12 feet wide and 120 feet long. 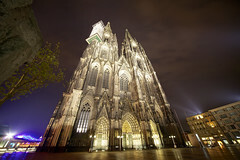 Its construction has been described as a masterpiece, using lattice trusses with interlaced 3-by-10-inch planks. It is held together with 2 inch hardwood dowels. Its road surface is covered with 3-inch planks. A concrete support was added beneath the midway point in 1927 to help the bridge support motorized vehicles. Wisconsin once had dozens of covered bridges. The last one to be demolished (in 1935) spanned the Wisconsin River at Boscobel. But the folks of Ozaukee County worked hard to ensure their covered bridge would be maintained for future generations. It was taken out of active service in 1962, as another bridge was built over Cedar Creek to handle vehicle traffic. In May 1965, the state historical marker was installed next to the bridge. Covered Bridge Park is located on Covered Bridge Road, which runs north and south between Highway 60 and Pleasant Valley Road just north of Cedarburg. As he prepared his six-seat Beechcraft C35 Bonanza airplane for takeoff, Richard E. Rickman asked airport manager John Stedman if he should take the most direct route, across expansive Lake Michigan to Detroit. Stedman cautioned against it, telling the pilot to fly east across Wisconsin to the lake, then hug the shore and make his way over to Michigan. This approach would presumably be safer, and provide great views for Rickman, his wife and four children. It was just after the dinner hour on Labor Day 1960. The Rickman family packed themselves into the aircraft at Alexander Field in Wisconsin Rapids, ready to make the flight home to Detroit. The family had been to Drummond, Wis., to visit Helen Rickman’s parents, then flew to the Rapids to visit other relatives. Richard, the son of a longtime shoe-store proprietor, grew up in Wisconsin Rapids. He was a descendant of pioneer resident Matthias Hanneman, who came to Wisconsin in 1866 from Pomerania. A factory representative for the Ogden Manufacturing Co., Rickman married the former Helen Anderson in December 1949 and they later moved to Michigan. Their first child, Richard Edward, was born in Lansing in May 1953. Robert John was born in Lansing in March 1955. Catherine Helen was born in Detroit in June 1956; and Patricia Ann joined the family in Detroit in September 1957. 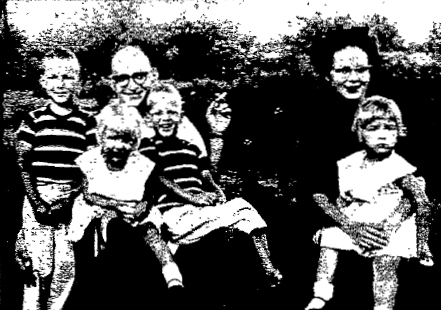 The Richard E. Rickman family, shown in a 1960 newspaper photograph. Left to right are Richard, 7; Patricia, 3; Richard Sr., 35; Robert, 5; Helen, 34; and Catherine, 4. The final day of the Rickmans’ visit was spent at the airfield. Rickman gave plane rides to his sister, Elvira Pluke, her husband Nolan and their five children. Rickman primarily used the single-engine aircraft for business trips. The family had recently flown to California in the plane, and then used it for the Labor Day weekend visit. The wheels of the Beechcraft left the ground of Alexander Field at 6:30 p.m. The Rickman family flew along the western shore of Lake Michigan. They were treated to an incredible view of the Chicago skyline as the aircraft flew less an a mile offshore. The first sign of trouble came near 7:30 p.m., when Rickman issued distress calls that were heard by ships and aircraft as far north as Milwaukee. Rickman radioed Meigs Field in downtown Chicago and asked permission to make an emergency landing because the plane’s engine was cutting out. Officials at Meigs Field gave Rickman permission for an emergency landing. He veered the aircraft out over the lake and circled to attempt a landing. Witnesses at nearby Oak Street Beach saw sparks trailing from the airplane. The 185-horsepower Continental engine caught fire and became enveloped in smoke. Suddenly, the 25-foot-long airplane turned straight down and plunged headlong into the lake. Hundreds of horrified beach-goers saw a blinding explosion as the plane hit the water. The Wisconsin Rapids Daily Tribune carried the horrifying news on September 6, 1960. William J. Cempleman saw the fiery crash from aboard the yacht Playtime. “The whole lake looked afire. Flames soared twenty-five to thirty feet,” Cempleman said. “When we got to the scene, a big circle of water was flaming. All we could see was an airplane wheel floating.” As the Playtime circled the crash site, Cempleman saw the charred body of little Catherine Rickman, 4, floating about 15 feet from the flames. Newspapers across America later published a dramatic Associated Press photograph of a police marine officer carrying the lifeless body of Catherine to shore. Resuscitation efforts failed. Police and Coast Guard vessels searched the waters off Oak Street Beach into the night. Divers used underwater lights to aid in the search, but found no trace of the aircraft or the other members of the Rickman family. 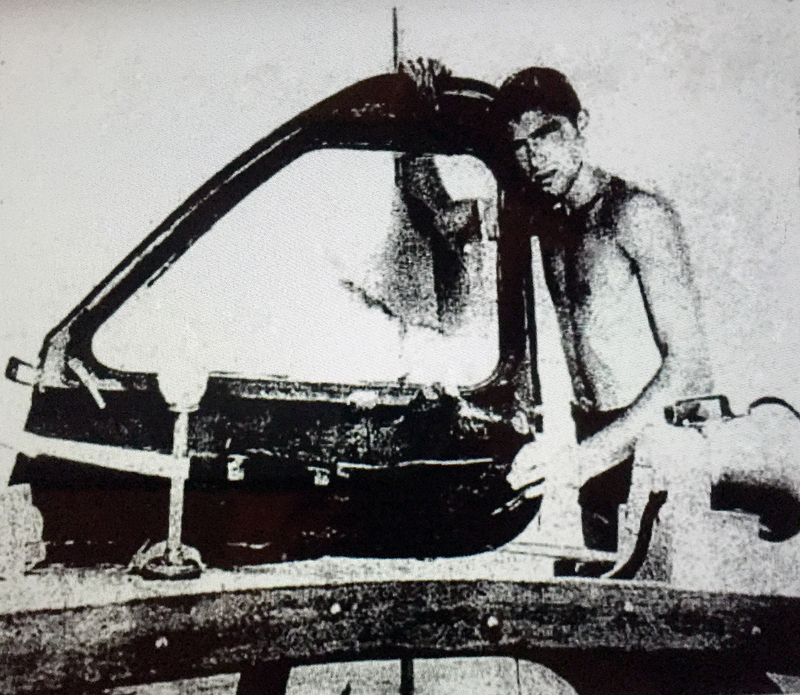 Divers resume the search on September 6, but did not locate the wreckage or the other victims until September 7. Diver Jeff Daxe, a commercial pilot, was the first to reach the bodies. 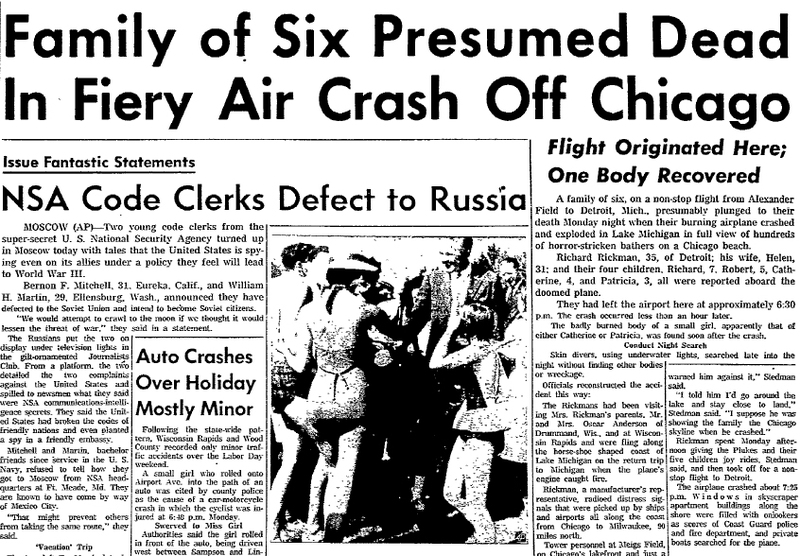 The Chicago Daily Tribune reported that one body was found 50 feet from the fuselage, while the other four were inside the wreckage. After the victims were recovered and taken to Burnham Harbor, it was discovered that Richard Rickman’s watch stopped at 7:38 p.m. The impact sheared off both wings, but only one was found. The engine and propeller were found some distance from the rest of the wreckage in about 30 feet of water. Two weeks after the crash, the Civil Aeronautics Board issued a preliminary opinion that engine failure had caused the crash. In late October the CAB confirmed that opinion, but said the engine would be sent back to the manufacturer for testing. It’s unknown if that ever happened. 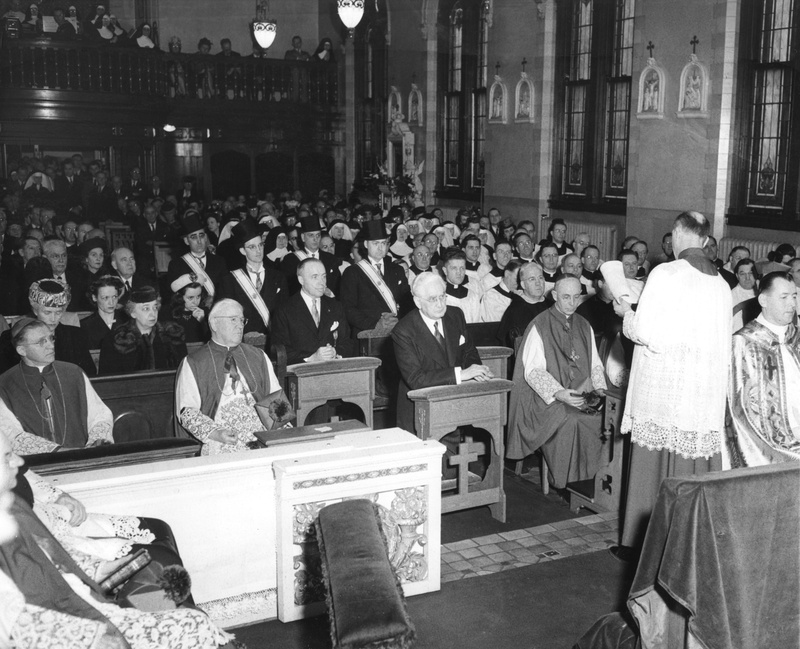 The six members of the Rickman family were memorialized at a funeral service on Saturday, September 10, 1960 at Immanuel Lutheran Church in Wisconsin Rapids. They were buried at Forest Hill Cemetery. 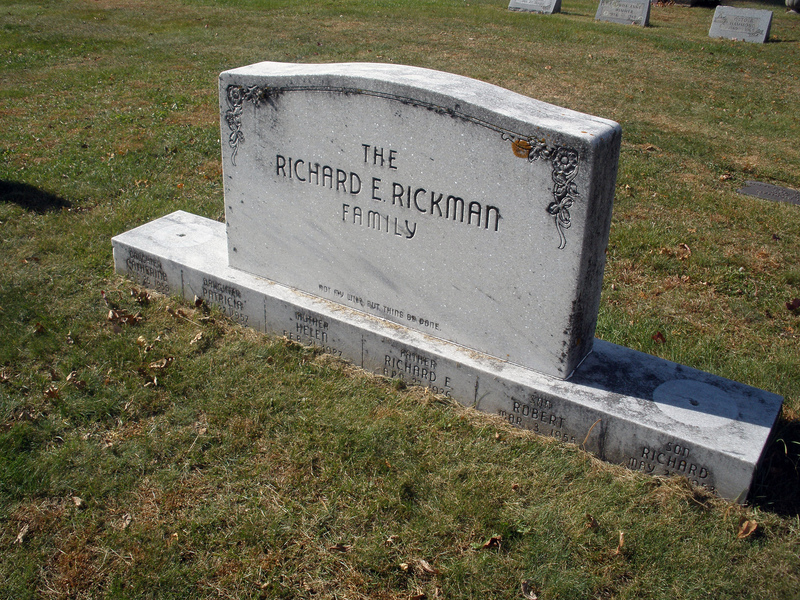 Richard Edwin Rickman was born on April 27, 1926, the youngest child of Edwin and Renata (Rathke) Rickman. Edwin John Rickman was the son of Christian Wilhelm Ludwig Theodor and Amelia Bertha Emilie Auguste (Hannemann) Rickman. 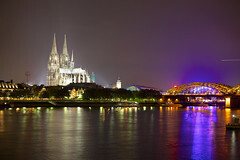 Amelia’s father was August Friedrich Hanneman, the son of family patriarch Matthias Hannemann. Richard Rickman graduated from Lincoln High School in 1943 and enlisted in the U.S. Navy in July 1943. He served more than three years in the Navy during World War II and was discharged as an ensign in September 1960. He graduated from Northwestern University with a degree in business administration. As a boy, I often got to travel with my Dad on his sales routes across Wisconsin to sell veterinary pharmaceuticals and supplies. One of his routes took him to Wausau, so we got to pay a visit to Hanneman’s Rock and Gift Shop, run by my great uncle and aunt, Wilbert G. and Irma Hanneman. Visits to the shop always resulted in getting to pick out something made from the most exquisite polished rocks and colorful crystals. Over the years, I developed a nice collection of treasures from the rock shop. I came to believe that Uncle Wilbert (nicknamed “Wib”) had made a career out of selling rocks and crystals. Actually, he and Aunt Irma took it up as a post-retirement labor of love after Wib’s long career in banking. 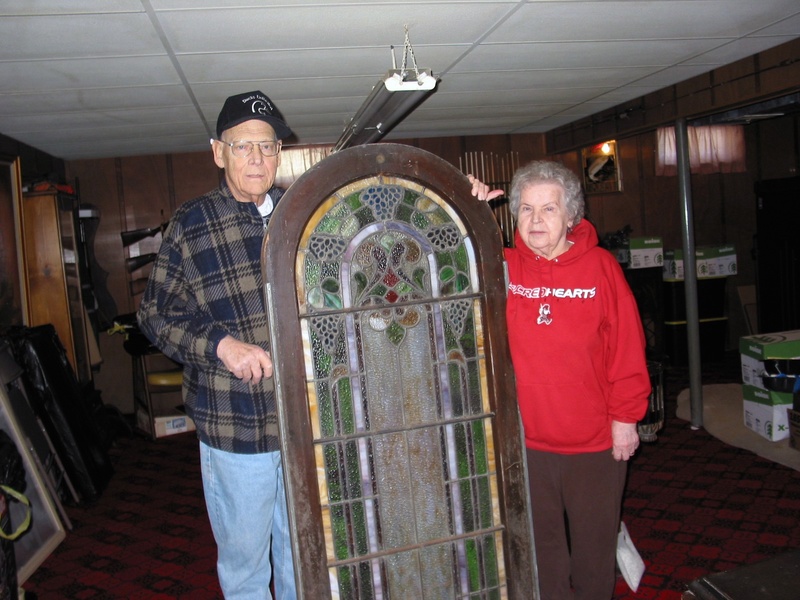 They sold gifts from the shop in their home at 130 Ninth Avenue in Wausau in the 1960s and early 1970s, but also attended craft shows and other events to peddle their intricately patterned wares. 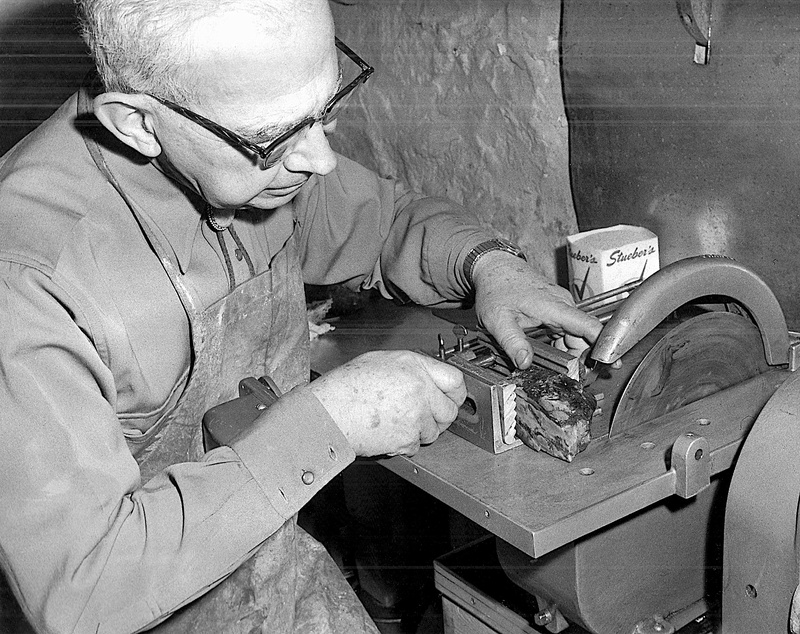 Wilbert G. Hanneman uses a diamond saw to cut slabs of Australian imperial red rhodonite. In December 1966, the Wausau Daily Herald-Record ran a photo page featuring the Hannemans and their rock shop. “What looks like an uninteresting rock to the average person may send a rock-hound into a joyous orbit,” read one of the captions. The photo showed Wib using a diamond saw to slice Australian red rhodonite into slabs. Another photo showed polished slabs of Brazilian agate, which were later used to make cuff links, ring settings and other items. Wilbert G. Hanneman was born May 1, 1899 in Merrill, Wisconsin, the third of five boys born to Charles and Rosina Hanneman. He was the older brother of my grandfather, Carl F. Hanneman. In June 1923, Wib married Irma Pagels and the couple moved to Wausau. 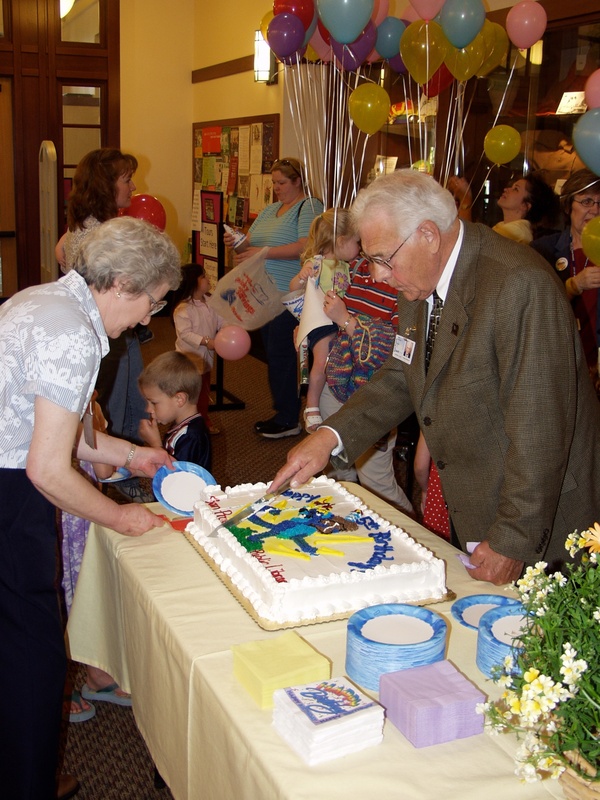 Wib had a long career working for the Citizens State Bank and Trust Co., from which he retired in 1964. Wib was a graduate of the School of Banking at the University of Wisconsin-Madison. Wib overcame a bout of polio that left him with a pronounced limp. Late in life he suffered a heart attack that forced him to give up his beloved cigars. Wib and Irma celebrated their 50th wedding anniversary in 1973. Carl, who was the best man, attended the anniversary doings. The couple had two children, Richard D. Hanneman and Lynn (Hanneman) Swanson Zarnke. Wib died in 1987 and Irma died in 1996. Irma Hanneman staffs the Hanneman Rock and Gift Shop display at a craft show. Irma Hanneman uses a grinding wheel to polish stones in 1966. Irma Hanneman at work in the Hanneman Rock and Gift Shop in Wausau in 1966. Irma and Wilbert Hanneman show off some of the bracelets they made using polished stones. Stones attached to dop sticks are ready to be shaped and polished. 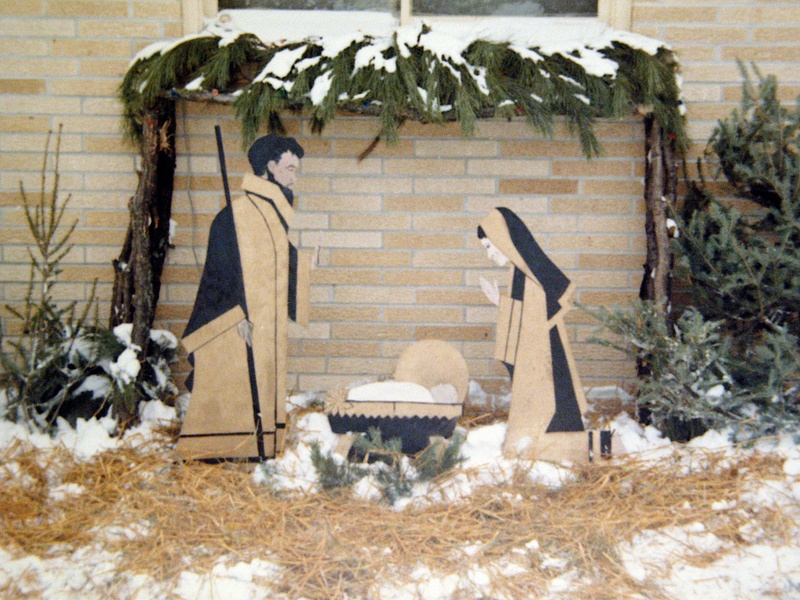 In the winter of 1966 or 1967, a young father designed and hand-crafted an outdoor nativity scene to decorate the family home in Sun Prairie, Wisconsin. David D. Hanneman (1933-2007) painted the set freehand and put it on display just under the garage window of his home on Wisconsin Avenue. The nativity scene was a fixture at the home in those early years, but eventually was put in storage and forgotten. The original Nativity scene as built by David D. Hanneman, circa 1967. Forty years later, after David Hanneman died, the badly weathered Nativity figures were rescued from a trash can in the garage. 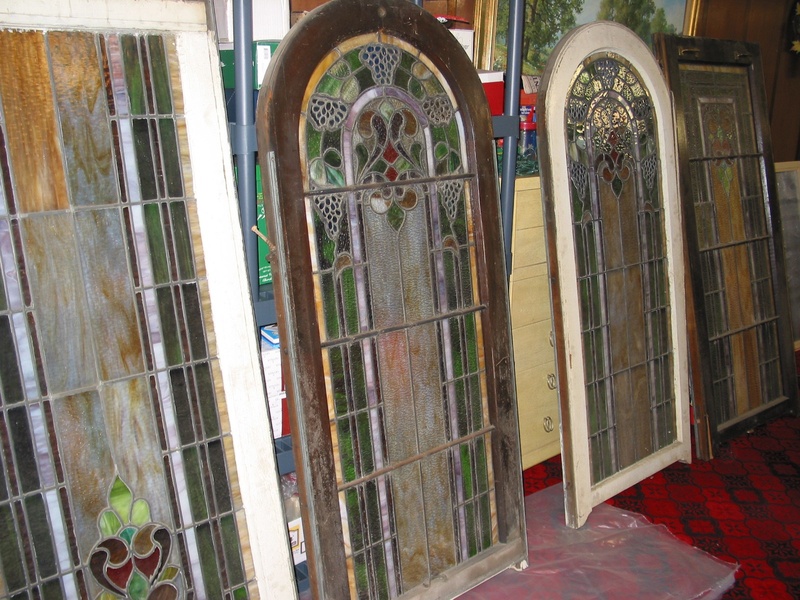 Over the next 18 months they were restored to almost original condition and put on display in the Village of Mount Pleasant. The original backers and braces were removed from the cutout figures of St. Joseph, Mary and Baby Jesus. New 1-inch-thick plywood backers were crafted with a jigsaw, then glued to the figures and anchored with wood screws. Heavy L-shape stabilizing braces were screwed into the backers to give the figures sufficient weight to withstand winter winds. Samantha J. Hanneman retouches details on the Baby Jesus figure built by her grandfather, David. D. Hanneman. 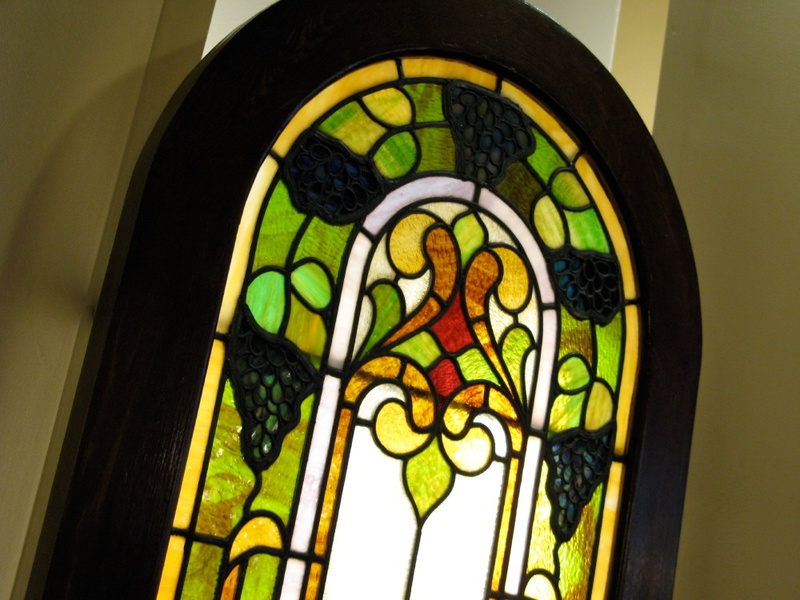 Samantha J. Hanneman, David Hanneman’s granddaughter, did most of the paint restoration work. 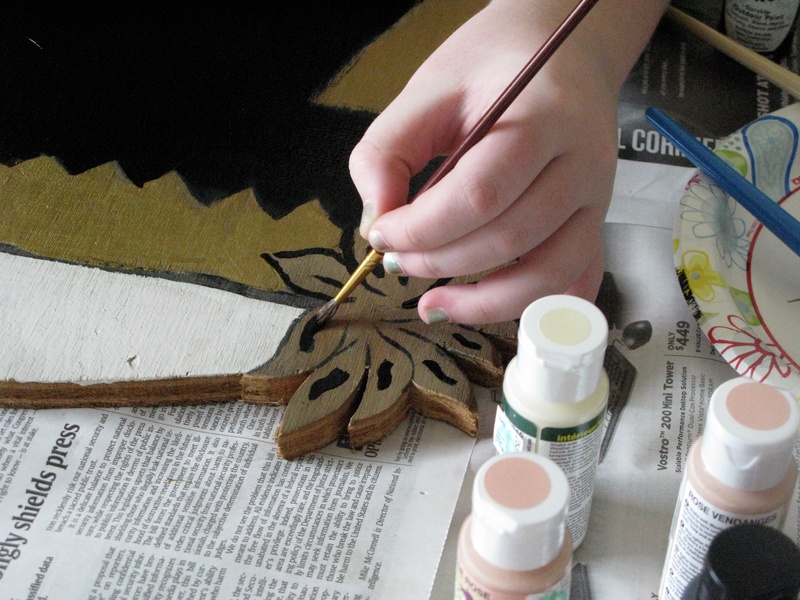 With a special set of art brushes, she applied metallic gold and flat black paint to maintain the original look. Touch up paint was applied sparingly to the faces and hands of the figures to keep the hand-drawn details. The newly restored Nativity scene was put on display at the Hanneman home in Racine County in December 2008, making the old tradition new again for another generation. The crèche was displayed for several years, but had to again be put in storage when we lost our home. Now the figures again wait patiently to have a new home where their warm glow will fill the Christmas night. St. Francis of Assisi is credited with creating the first Nativity crib or crèche on Christmas Eve 1223 in Greccio, Italy. St. Francis was eager to make the birth of Christ something tangible for the faithful. He had a manger built, brought animals to be part of the set, and had Holy Mass said before this representation of the birth of Christ. 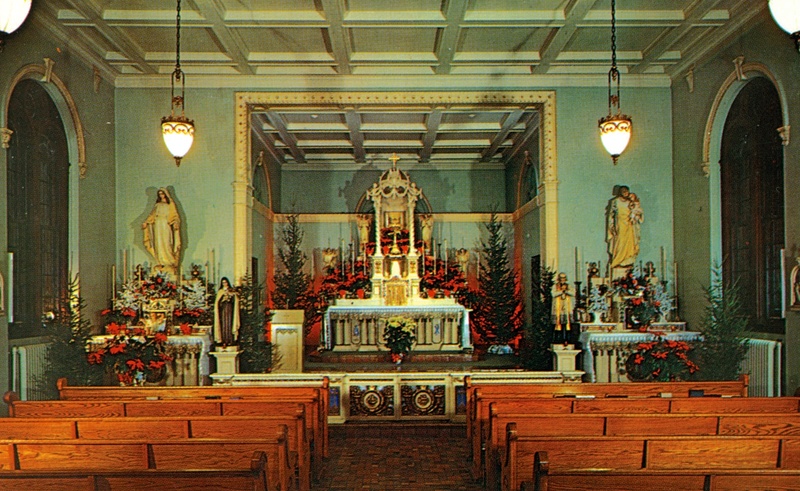 After the preparations were finished, St. Francis and some of his followers went to the crèche for the Mass. After a short prayer by Francis, a vision of the Christ child appeared on the hay. The miracle stirred the animals and greatly moved the faithful who witnessed it. The Nativity scene is visible at center. On the driveway is David C. Hanneman, 3. Samantha J. Hanneman spent hours repainting and restoring her Grandpa’s Nativity set. Samantha J. Hanneman used lots of metallic gold paint in her Nativity restoration work. Care was taken to maintain the original details. It was slow, painstaking work retouching the Nativity figures. Restoration work on the Blessed Virgin Mary figure is almost complete. The fully restored Nativity scene on display in Mount Pleasant, Wis., in December 2008. I have nothing but good memories of Halloween. Growing up in the late 1960s and early 1970s, October 31 was a date we looked forward to. Whether we got to buy a costume at the dime store or made our own, it was always an exciting night. 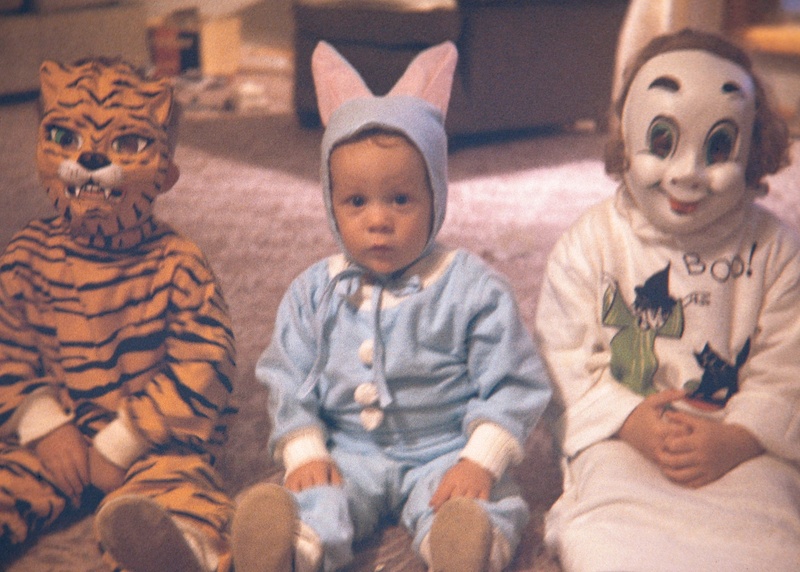 My brother David (left), yours truly at center at cousin Laura all set for Halloween at our home in Grand Rapids, Mich., circa 1964. 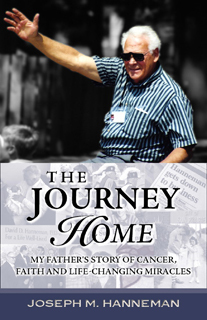 One of my most vivid Halloween memories was documented in my book, The Journey Home. I recall Dad tearing out the front door in his sock feet. I wondered what was happening. We figured it out a few minutes later when he dragged two teenagers into the front door and made them apologize for smashing our lit pumpkins. He then turned them over to Sun Prairie police. We had one sad Halloween when my brother David fell into the neighbors tree well and spilled all of his candy. We all shared to make up for it. Another year, we went across town to “trick or treat” at a few houses of family friends. At one door, I was shocked that the lady who answered called me by name. “How does she know me with this costume on?” I wondered. My brother chimed in, “You forgot to put your mask down.” D’oh! 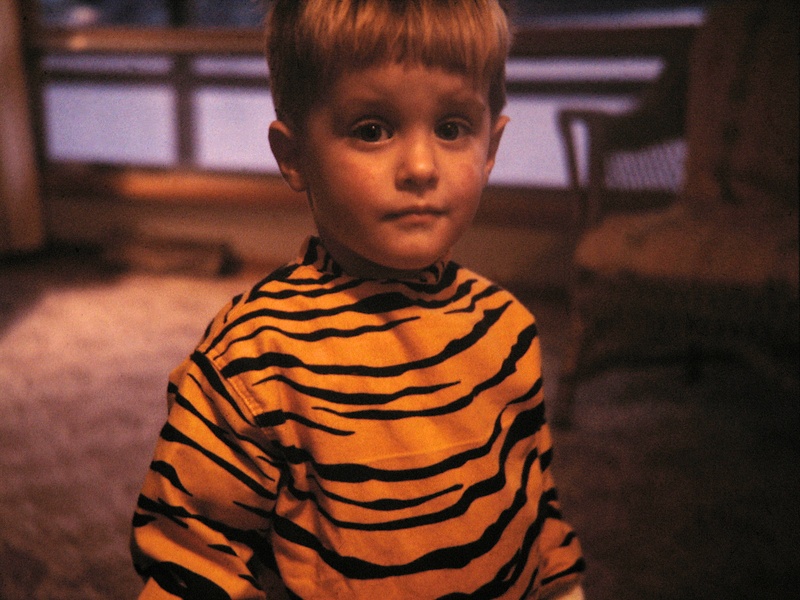 David C. Hanneman was a tiger for Halloween 1964. Perhaps the most fun we had was creating our own costumes. Lighting the end of a cork on fire, then using the charred remains to paint black whiskers on our faces. Stuffing pillows up an oversized shirt helped complete the hobo look. It wasn’t until toward the end of my trick-or-treating days that the scare over supposed razor blades in candy apples occurred. Hospitals offered to X-ray candy bags to check for pins or razor blades. That made me wonder if the candy would then glow? Ah, as it turned out the whole thing was a fraud that took on the sheen of urban legend. 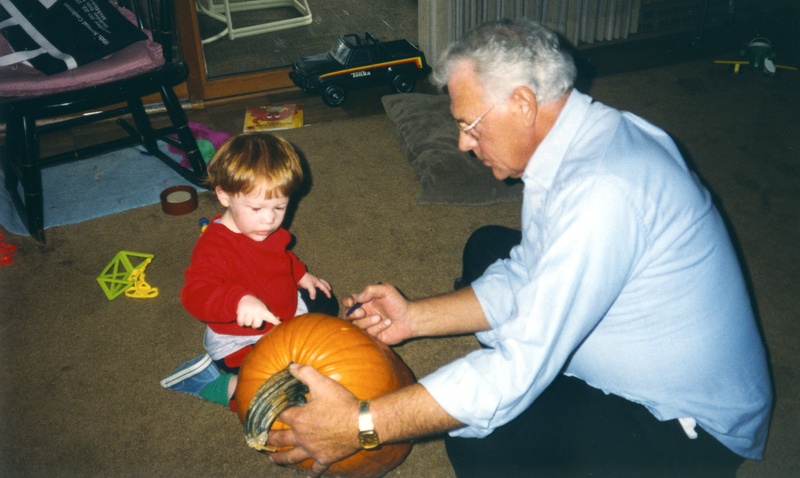 Son Stevie watches Grandpa Dave Hanneman prepare to carve, circa 1993. Once I had my own children, Halloween took on a new dimension. Our firstborn was too shy to go door to door, so we made our main stop at Grandma and Grandpa’s house. Eventually, Halloween became a major event. French onion soup or chili simmered in a crock pot while we took the kids around the neighborhood collecting goodies. Then we retreated into the warmth of the house for good food, warm apple cider and pie. The kids also ate candy. 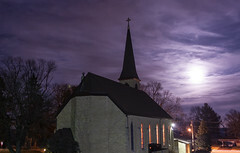 With the more recent controversies claiming Halloween as un-Christian or even satanic, it was refreshing to read this article on About.com regarding the Catholic roots of Halloween. Son Stevie with Mom and the largest pumpkin we ever had, circa 1992. Stevie Hanneman poses before the pumpkin pile at Swan’s Pumpkin Farm, circa 1995. Stevie Hanneman and a friend trick or treat in a Sun Prairie neighborhood in 1994. Dad with Stevie and Samantha Hanneman at Swan’s Pumpkin Farm, 1997. We made Swan’s Pumpkin Farm an annual outing for more than 15 years. Samantha Hanneman carves her pumpkin, circa 2002. Little Ruby Hanneman as a bumblebee, helped along by brother Stevie in 2000. Brand new puppy Mr. Puggles looking more like a black cat than a Pug. Ruby and Samantha Hanneman carve pumpkins in full face paint. Stevie, Samantha and Ruby Hanneman, along with cousin Geoffrey LaCanne (center). Samantha Hanneman hands out candy on Halloween, circa 2007. Samantha Hanneman as Minnie Mouse. Ruby Hanneman with cousin Geoffrey LaCanne. Ruby Hanneman (at right) with a neighborhood friend. We just had to pose Samantha Hanneman with this sign on Halloween, circa 2010. Few things in the American experience are held so dear by so many as the parade. From the smallest rural towns to the heart of New York City, Americans have long held celebrations by parade. 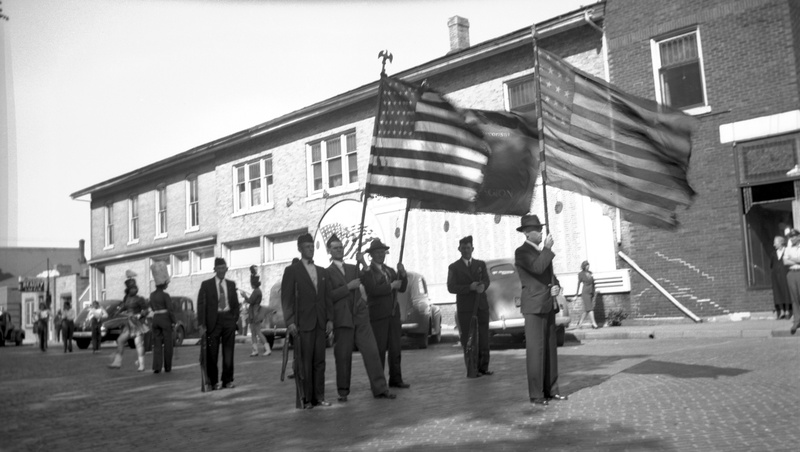 Members of the American Legion prepare to march in a parade in Mauston, circa 1942. Reasons for parades are as varied as the communities in which they take place. Perhaps the most widely celebrated type of parade is the Independence Day or July 4 parade. New York has its St. Patrick’s Day Parade and the famous Macy’s Thanksgiving Day Parade. The Left Coast has its parades of bacchanalia and pride. America’s heartland gathers for high school homecomings, Memorial Day, Christmas, Thanksgiving and special-themed parades such as the old Circus World parade in Milwaukee. 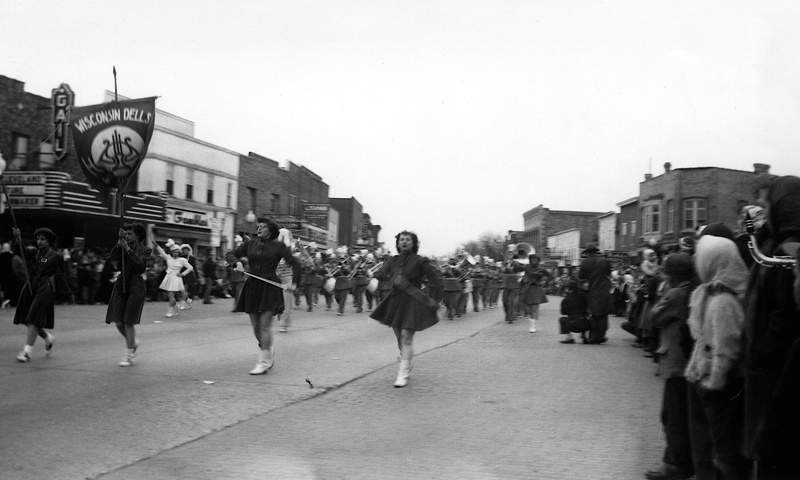 The Wisconsin Dells marching band parades down State Street in Mauston, circa 1942. High school and college marching bands are a frequent source of parade entertainment. Other favorite parade participants include brigades of toddlers on tricycles, doll buggies pushed by little girls and the myriad parade floats and displays honoring the nation’s military. Parades have long been used as a way to project military might, such as the goose-stepping Nazis of Germany or the show of ballistic missiles in Communist Russia. In America, ticker-tape parades became a favorite way to welcome home troops and war heroes such as Gen. Dwight D. Eisenhower and Admiral Chester Nimitz. The original ticker-tape parade was held in New York to celebrate dedication of the Statue of Liberty. A memorable parade in summer 1969 honored the Apollo 11 astronauts. David D. Hanneman prepares to ride a horse in a Mauston parade, circa 1942. David D. Hanneman (at right) and other boy scouts before a parade in Mauston in the early 1940s. Mauston Boy Scouts enter the parade line, circa 1943. The town’s military honor roll can be seen on the side of the building. A marching band in downtown Mauston in the late 1960s. A fire truck heads down the parade route in Mauston in the late 1960s. Residents of Mauston, Wis., mill about the downtown area during a parade or community festival in the mid-1940s. Smith’s IGA market is visible across the street. David D. Hanneman (1933-2007), a member of the Mauston High School Marching Band, poses outside his Mauston home in 1948. 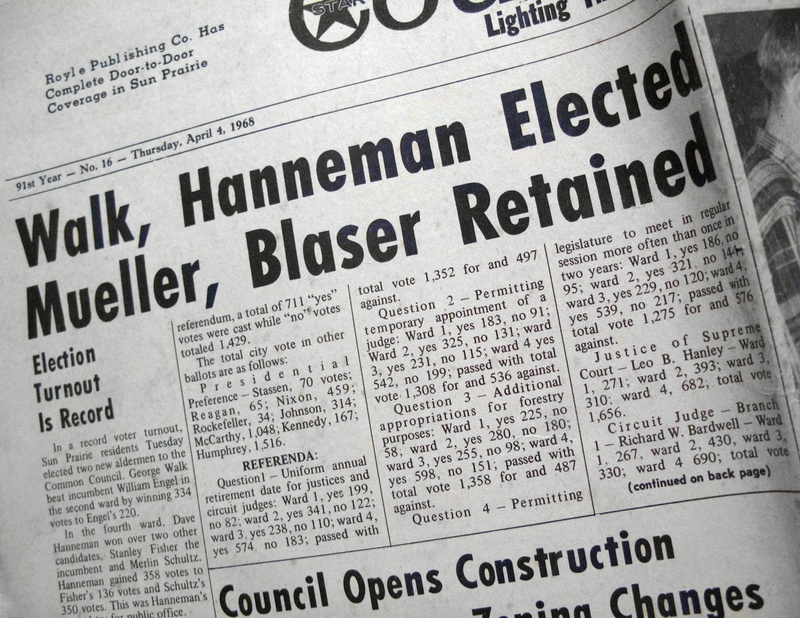 Hanneman, who later in life became mayor of Sun Prairie, Wis., played bass drum and trumpet. The Mauston High School Marching Band performs in a parade in downtown Portage, Wis., ca. 1948. 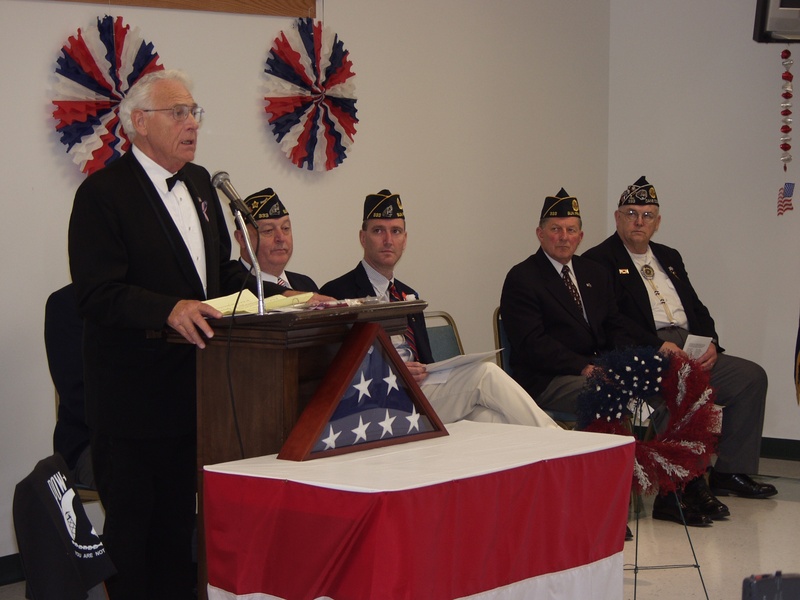 In the foreground is bass drummer David D. Hanneman (1933-2007) of Mauston. Sun Prairie Mayor David D. Hanneman waits to enter the parade route in Sun Prairie, circa 2003. Sun Prairie Mayor David D. Hanneman rides in a local parade, circa 2004. David D. Hanneman in what appears to be a drum and bugle corps uniform, circa 1948. The Mauston High School Band after leaving the football field during a homecoming game in the 1940s.